A detonator is a small explosive device that activates a larger bomb while ensuring a time delay for safety. Detonators can be electrical, chemical, mechanical, or wireless, meaning that a cellphone can be used to trigger the electrical charge necessary to initiate the larger explosion. In most detonating mechanisms, a fuse that is inserted into the larger explosive device is set off by connected chords that run an electrical charge from the detonator to the bomb itself. 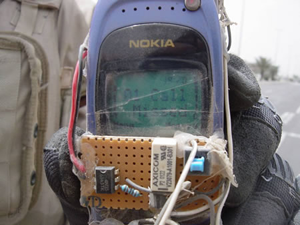 Nokia detonator with "01 call missed," July 2, 2007, by abaporu is licensed under CC BY. N.d. The National Homeland Security Knowledgebase: Bomb Basics. http://www.nationalhomelandsecurityknowledgebase.com/Research/Internatio..., accessed January 8, 2015.